Back to: Sonic the Hedgehog (2013 game). 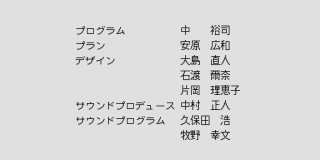 Too view the Japanese credits start a "No Save" game and choose a character. When the SEGA logo screen appears type the letters A-G-E-S in that specific order. A ring will chime if done correctly. This code will also change Tails name to "Miles" during gameplay. Various unused sprites found through debug or other methods. "Zone" Icons. 1-6 can be found in the original game but the 7 is new. Meant to mark which special stage the player was currently in. The Sonic 1-up icon was in the original game but the Tails and Knuckles ones are new. Fully functional and disappear like a ring when touched. "W" Icon. Not a new item and acts like a solid block when placed. Eggman monitor. Causes the player to take damage when the monitor is broken. Was present in the original game but was not fully functional. Goggles monitor. Adds the unused goggle sprites from the previous version of Sonic 1 and increases the amount of time the player can spend underwater. "S" monitor. Not a new monitor but functional in this version. Causes the player to become "Super". Spike monitor. Toggles the spike damage behavior when the monitor is broken. Three Shields monitor. May toggle the elemental shields option. Emerald Monitor. May toggle the max Emerald count. Sonic Triple Trouble is the first game to include a Emerald monitor. Either an exclamation point or the shrink powerup from Chaotix. Not used in debug mode. Green Hill Zone giant ball. Was present in the original version but is functional now. It can destroy walls or enemies that come in contact with it while it is in movement. A rather famous unused badnik, he is programmed into the game but as a secret. His coloring seems to be based on the trading cards. When placed with debug, it will hop around the area it was placed, or in a set direction. Spikes which move horizontally in Marble Zone. When placed in debug mode, UFOs will appear in the sky of Marble Zone. These were seen in promotional pictures and footage for the game. Goggles will be added to Sonic's sprite if this monitor is broken. They increase the amount of time he can spend underwater without needing air. The left image shows the back of Robotnik's legs, which can't be seen normally. The right image is what is normally seen. These are leftover Tails life icons from the 2011 Sonic CD port. Leftover Sonic life icon from the 2011 Sonic CD port, present among the HUD sprites. Likely related to Retro SDK's level editor which is used to create the game. The same icon was found in the Sonic CD port.